For years now, ever since the early 1960s, Rockbrook has been holding camp dances with the boys of Camp Carolina— both camps shared the same owners, the McConnells, for a while beginning in 1961 (Have you seen the RBC History Video?). 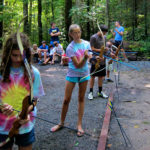 In addition though, we’ve also held archery, riflery and tennis tournaments each session, with the RBC girls challenging the CCB boys to a friendly competition. It was today that our sharpest arrow and bullet launching ladies and racket wielding women traveled across town to show the boys how it’s done. The girls, dressed in special t-shirts they made for the occasion, came ready, and by the end of the morning, had soundly beaten the boys in all three sports! 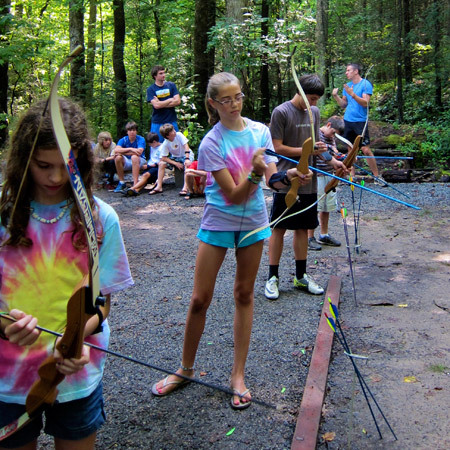 Archery scored more than 90 points to best the boys and riflery won by more than 10. A great showing! Back at camp, Kelly and the Equestrian staff had organized a barn party for everyone, both riders and non-riders alike. 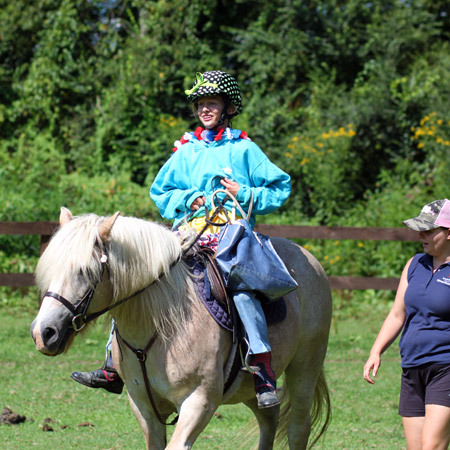 There were simple hand-line pony rides and other games to try, but the funniest event was a relay that challenged two groups to put on baggy clothes and ride across the field the fastest. Riding in all those layers, and carrying an enormous handbag made it a little challenging too! 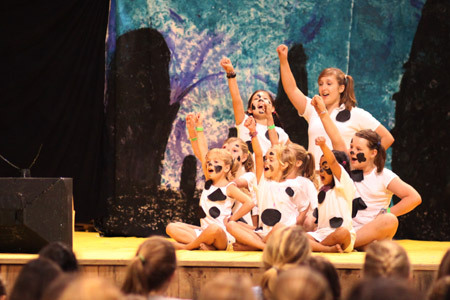 After packing our trunks and moving them to the Landsports barn for tomorrow’s pickup, we were treated to this camp session’s musical performance, 101 Dalmatians. This was a delightful production with homemade costumes (lots of white puppies with black spots, hair in ponytails as ears! ), painted scenery, props, as well as choral numbers, solo songs sung, and a cute suspenseful story. The fiendish Cruella de Vil, who plots to make a dalmatian fur coat, is foiled in the end and Roger and Anita adopt all of the 101 puppies spared, the cutest, most bright-eyed smiley puppies you’ve ever seen. 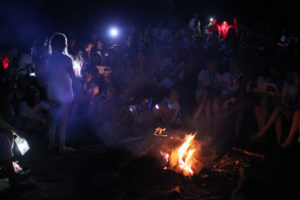 The final event of this, our last full day of camp this summer, was our traditional all-camp campfire we call our “Spirit Fire.” The setting for the campfire is beautiful with all of the campers and counselors dressed in their white and red uniforms, a bright orange, yellow and white fire blazing, the huge white oak and hemlock trees towering above with the dimming grey blue sky above us. The tone of the evening is more serious and reflective than what we ordinarily enjoy at Rockbrook, as tonight’s program is something that’s been passed down for generations— traditional, harmonious songs, and short speeches and comments about camp prepared by campers from each Line, counselors, and Sarah. These are opportunities for the girls to say something about what Rockbrook has meant to them this summer, to express how they feel about camp and the people they’ve come to know and befriend while here. Some of the comments are quite moving, easily bringing emotional tears, while others are truly insightful, like tonight when a counselor told us that for one of her campers, she loved RBC because “it’s the kind of place where it’s OK to wear your shirt inside out.” That seemed spot on. To put it differently, Rockbrook is a place where it’s OK to be your real self, where you’ll be loved for who you really are, and not for just your appearance, talents, or grades. It was such the perfect thought to end this wonderful session. In so many ways during this time together, we’ve lived with our shirts inside out. And it’s been great!